It came about from a quick game we made for a game jam – where the theme was Small World. See previous posts for more on that. After the great feedback we got from other game developers during the game jam, Ludum Dare, we decided to expand the game and put it out into all the app stores. It had been called Superbugs, during the game jam, but once we decided to put the game out we discovered that there is already a game with that name. So, after consultation with an actual scientist (Berni’s brother at York University) we chose the name VIROME. It refers to the viruses that live in the human body – so it seemed appropriate. Plus – there was definitely no other game with that name! Nathan expanded the original concept to include 28 increasingly difficult levels. Complete those and you unlock the Daily Viromes – a new Virome to defeat each day. This mode is ideal for competition among friends and family as you all see the same puzzle on each day. 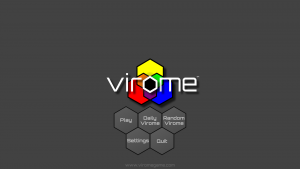 There is also a Random Virome – which gives you a unique puzzle each time you click it. So, you’ll never run out of puzzles to try. As we say – a scientist’s work is never done! There are MANY colour-matching games out there – usually match three or more of the same colour to clear a grid. 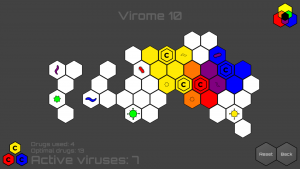 Virome is a different take on colour-matching that involves matching the colours to the viruses – which will involve some colour combining as well as making sure that no cell gets overdosed! It will have you addicted in no time. Download it now before it goes viral!